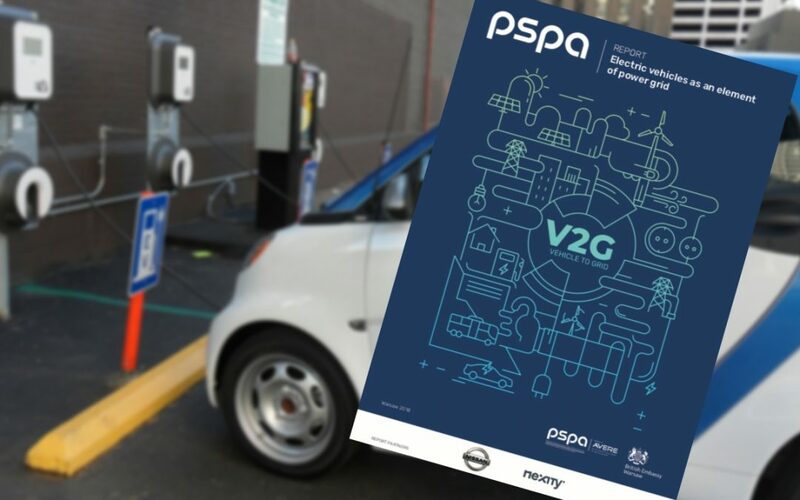 The Polish Alternative Fuels Association (PSPA) and the British Embassy in Poland have prepared a report on the development of electromobility and the problem of integrating electric vehicles with power grids. The publication systematizes knowledge about the assumptions of the Vehicle-to-Grid concept and confronts it with the current solutions implemented in selected European countries. ‘Large scale deployment of electric vehicles will not only change the way we use cars but will also have significant impact onelectricity demand and the way the electric grid operates. Integrating electric vehicles with the grid will be a big challenge. One way to achieve this is to implement new technologies suchas a Vehicle to Grid (V2G) system. This would enable plug-in electric vehicles to provide bidirectional flows of energy, whenconnected to the grid, helping to manage peaks and troughs in demand’ – writes Jonathan Knott, British Ambassador to the Republic of Poland, in his foreword to the report. ‘The analysis of the V2G technology potential deals both with the cognitive and application aspects. The aim of the first part of the Report is to present the essence of the V2G concept. The potential of mobile electricity storage has been shown together with the main elements of the power grid architecture that are necessary for the deployment of the service. The scenario fortwo-way cooperation between electric vehicles and the gridmade it possible to identify the most important mechanisms providing added value for individual stakeholders involved in the development of this technology. The second part of the Report is devoted to the presentation of the current achievements in the development of the V2G technology’ – encourages Maciej Mazur, Managing Director of the Polish Alternative Fuels Association.